The man in the pink cap is sitting in front of a bathroom scale, which he charges customers five rupees to use. You may wonder if this is a legitimate small business or just augmented panhandling, but I can confirm that this enterprising gentleman is filling a market niche: two people paid to use his scale during the three minutes that I stood there watching. How about we play with this scenario using a little math? Let us assume that I witnessed a particularly busy period, and this business person actually brings in customers at half that rate, or 20 customers per hour. At five rupees per customer, that tallies up to 100 rupees per hour. 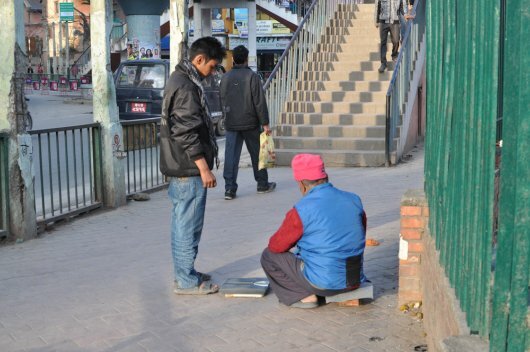 During a typical Nepal work day from 10am to 5pm, this guy could earn 700 rupees per day. As I have learned during my Kiva field work, small entrepreneurs here work seven days a week, so this particular business man likely does as well; still, let us shave off 10 days per year for festivals, illness, and other events. Working 355 days per year, this man could earn almost 250,000 rupees annually. Converted to USD at today’s exchange rate, this amount equates to approximately $3,450. For simplicity’s sake, let us assume that he paid for his scale in full at the time of purchase, so he is not incurring financing fees. If we subtract $30 for a standard bathroom scale, a capital cost that probably needs to be replaced every year, his annual profit is about $3,420. A 2009 Asian Development Bank Nepal Fact Sheet reports the per capita income at $447 per annum. Therefore, this man, along with his easily portable bathroom scale, earns more than seven and a half times the average Nepali’s income. Not bad! Next time I will think twice before questioning something seemingly funny on the street. Except, of course, if I see a working elephant on the roads again. Still waiting for an explanation about those economics. Post by Claudine Emeott. This post originally appeared on The Kathmanduo, the blog Claudine and her husband are keeping while in Nepal, where Claudine is a Kiva Fellow working in microfinance. CoLab Radio will post pieces of their journey as it unfolds over the coming months.